I am aware that this article won’t endear me to several of my thin-skinned Buhari/APC partisan readers who, interestingly, wildly acclaimed my past articles that pilloried former First Lady Patience Jonathan’s sidesplitting grammatical transgressions. But I am never one to shy away from embarking on what I’m convinced is a just and fair undertaking because of a fear of backlash from mawkish, hypersensitive crybabies. In any case, in my Saturday column—and in my Facebook status updates—I have defended Wife of the President Aisha Buhari against Gov. Ayo Fayose’s brash and reckless calumny against her. In an ironic twist, it was her bid to give the lie to Fayose’s charge that she couldn’t visit the US without being arrested that caused her to come here and give a speech at the United States Institute of Peace (USIP) that is the subject of this column. Mrs. Aisha Buhari’s speech at the United States Institute of Peace didn’t rise to the level of former First Lady Patience Jonathan’s legendary contortion of English grammar, but it was inexcusably egregious nonetheless, not least because it was supposed to be the product of preparation and forethought. “Boko Haram issue” is the antecedent for the pronoun “it” in the sentence quoted above, which makes the pronoun superfluous since it appears in the same sentence as its antecedent. “Boko Haram is a global issue…” would convey the same meaning—and without the ungrammatical baggage. I admit, though, that redundant pronouns of the kind I identified in Mrs. Buhari’s speech occur in nonstandard native English dialects. But we are talking of an official speech in a formal context in a foreign, English-speaking country. 3. A curious resultant “done.” During her speech, Mrs. Buhari praised the University of Maiduguri for remaining open even in the worst moments of Boko Haram insurgency. “The university really done us proud,” she said. This is a misuse of the past participle “done” that linguists call the “resultant done.” It is curious because it is typical of the informal, nonstandard (and sometimes illiterate) speech of the American south. Apart from the weak, messy transition, that’s some really dizzyingly incoherent verbal blizzard! Second, there is always a tone of disapproval when a government is referred to as a “regime.” That is why the word is often reserved for military and other totalitarian governments. Even the Associated Press Stylebook defines “regime” as “the period in which a person or system was in power, often with a negative connotation. For example, Saddam Hussein’s regime, the Nazi regime.” I hope Mrs. Buhari doesn’t consider her husband as the honcho of a regime. “An ‘academician,’ on the other hand, is a person who works with or is honored with membership into an academy, that is, an institution devoted to the study and advancement of a specialized area of learning such as the arts, sciences, literature, medicine, music, engineering, etc. Examples of academies are the Nigerian Academy of Letters, the Royal Academy of Arts, the Royal Academy of Music, the Royal Academy of Engineering, the Royal Swedish Academy of Letters, History and Antiquities, the National Academies of Sciences, Engineering, and Medicine, etc. “Not all academics are academicians and not all academicians are academics. In other words, you can teach in a university, polytechnic, college of education, etc. and never be made a member of an academy, and you can become a member of an academy without ever being a teacher or a researcher at a higher educational institution. Note that while most academicians are also academics, most academics are never academicians. Mrs. Buhari obviously needs a lot more help than she is aware of and is getting. She is grossly ill-served by her speech writer, who also probably manages her social media accounts. The recent grammatical bloopers from her Facebook page (which were quickly cleaned up after she became the object of ridicule on social media) could be an indication that her speech writer is also her social media manager. Given how much she is thrusting herself into the public eye, her poor grasp of English grammar will soon become grist to the humor mills—like it was for Patience Jonathan. She can avoid this by doing the following: (1) recede to her quiet, unobtrusive self, (2) bone up on basic English grammar, (3) surround herself with people who give a thought to grammatical correctness and completeness, or (4) speak in Fulfulde or Hausa and get an English translator. 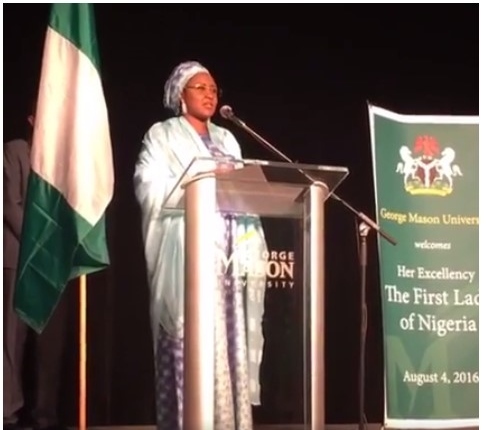 Mrs. Aisha Buhari spoke at George Mason University, Washington, DC, not at the USIP. It's "sore thumb," not "sore thump." Dr. Goodluck Jonathan, That Was Embarrassing!